Downloadable image files for postcards, etc. The 2008 poster by Gary Mathews. A big THANK YOU to Gary who donated his artwork, as he has done since our first event! Another great watercolor by Gary Mathews. 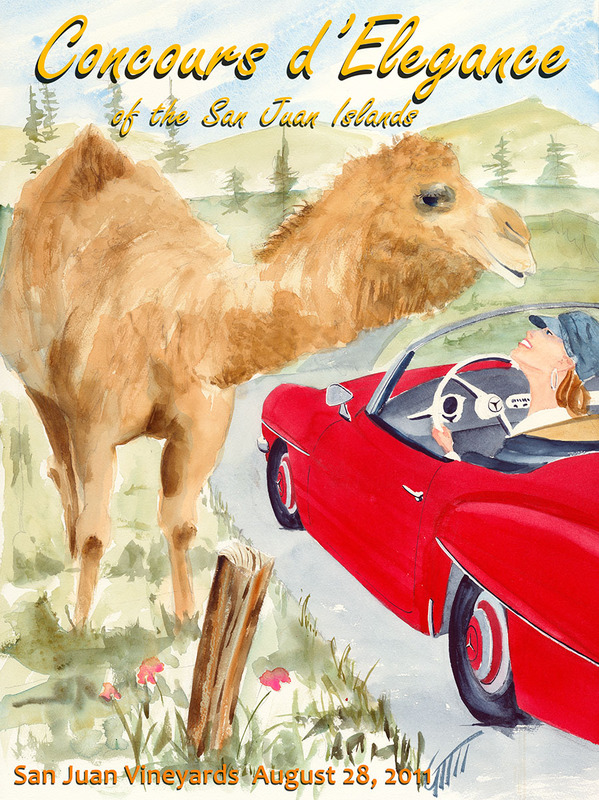 The 2006 poster by local artist Gary Mathews. 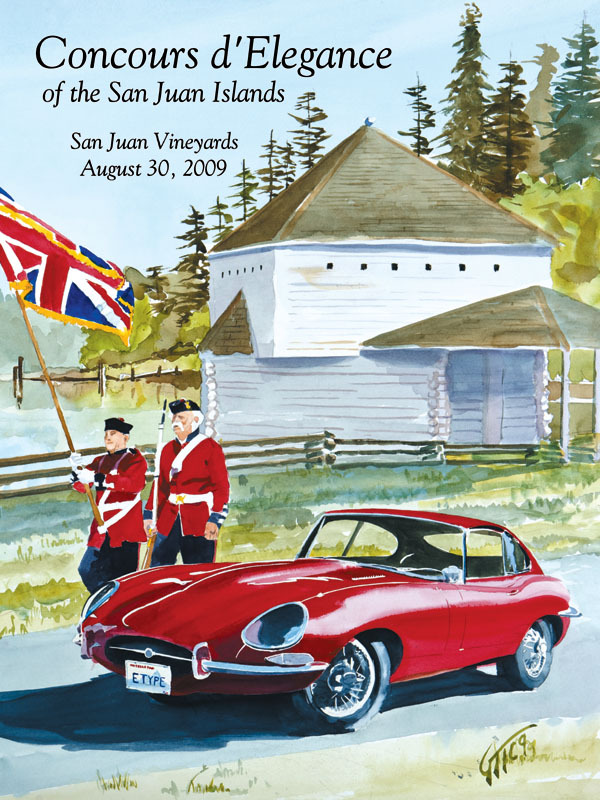 The Rotary Club of San Juan Island and the Sports Car Club of the San Juan Islands invite you to their 13th annual Concours d’Elegance and car show the San Juan Vineyards on Saturday, August 24, 2019 from 11:00 am to 3:00 pm. Classes will include: German, American, Other Countries, Custom/Modified/Hot Rod, and Motorcycles. Classes are open entry with all vehicles eligible for 1st, 2nd, and 3rd in Class, Best in Show, and People’s Choice awards. For those seeking overnight accommodations, summer is a very busy time on the Islands and you are encouraged to make lodging reservations as soon as possible. See our "Travel" page to the left. A huge thank you to all who attended last year's Concours at the San Juan Vineyards. The weather turned out perfect in spite of the forecasts, and nearly $18,000 was raised for the beneficiaries. We had a another terrific event for 2017, and a huge thank you! to the participants, sponsors, spectators and volunteers who helped to make this year a great success, and a record for money raised for our beneficiaries. 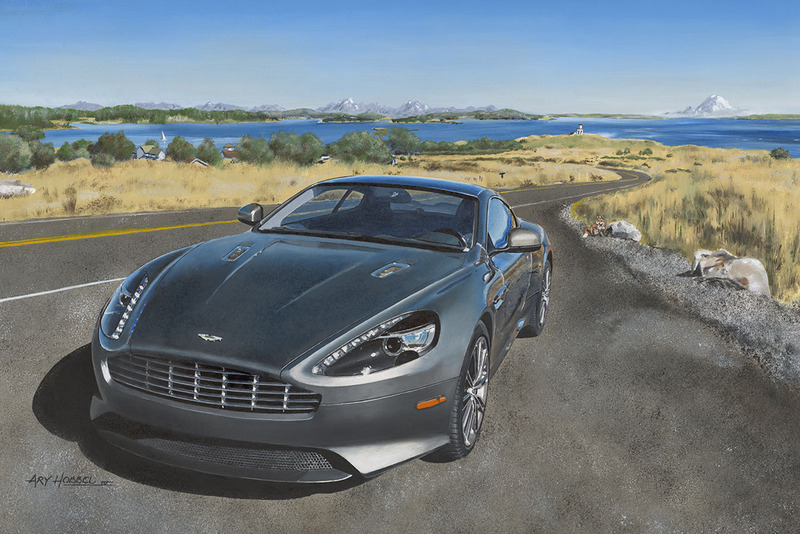 This was our eleventh Concours at the wintery, organized by the Sports Car Club of the San Juan Islands and the Rotary Club of San Juan Island. The Concours is a charitable event, with over $18,000 distributed to the Family Resource Center, Hospice of San Juan Island, the Family Umbrella Group, and Rotary‛s PolioPlus Project. During the last eight years, over $75,000 has been distributed to six different charities. This has been possible through generous donations by Sponsors, Entrants, and Spectators. We had a great event for 2016, a huge thank you! to the participants, sponsors, spectators and volunteers who helped to make this year a great success. This was our tenth Concours at the wintery, organized by the Sports Car Club of the San Juan Islands and the Rotary Club of San Juan Island. 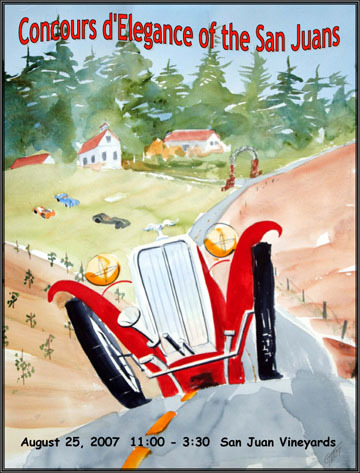 The Concours is a charitable event with this years’ net proceeds of $13,600 distributed to the Family Resource Center, Hospice of San Juan Island, and Rotary‛s PolioPlus Project. During the last seven years, over $60,000 has been distributed to six different charities. This has been possible through generous donations by Sponsors, Entrants, and Spectators. We had a great event, with $8,600 going to the Hospice of San Juan, ‘Round Towner Charity Taxi, and Rotary’s PolioPlus Project. During the last six years, over $50,000 has been distributed to six different charities. This has been possible through generous donations by Sponsors, Entrants, and Spectators. We had another great event this year, with perfect weather, terrific cars and bikes, great music and a great turnout. Between entrants, donations and sponsors we raised almost $10,000 for the three beneficiaries. This year, the Concours consisted of a “Judged” section and a “Display Only” section, with all vehicles eligible for the “People’s Choice” awards. 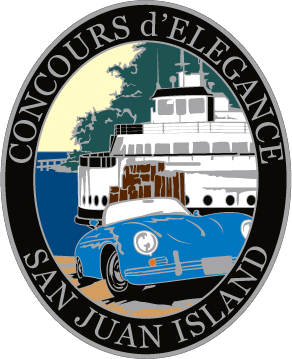 The Concours is a charitable event with this years’ net proceeds going to the San Juan Island Family Resource Center, the San Juan Historical Museum, and the Rotary’s PolioPlus Project. During the last five years, over $37,000 has been distributed to six different charities. This has been possible through generous donations by Sponsors, Entrants, and Spectators. 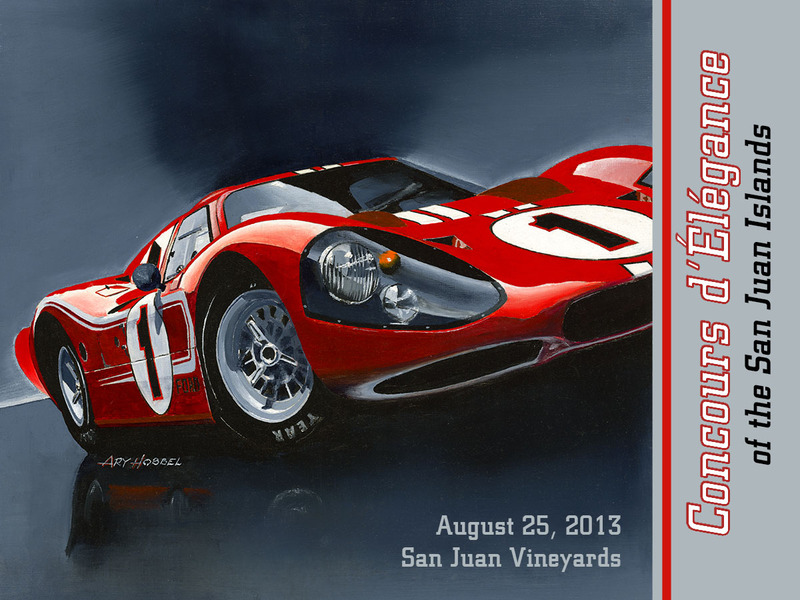 Thank you to everyone who participated in the 7th annual Concours d'Elegance on Sunday August 25, 2013. We had a great turnout and a very successful event. 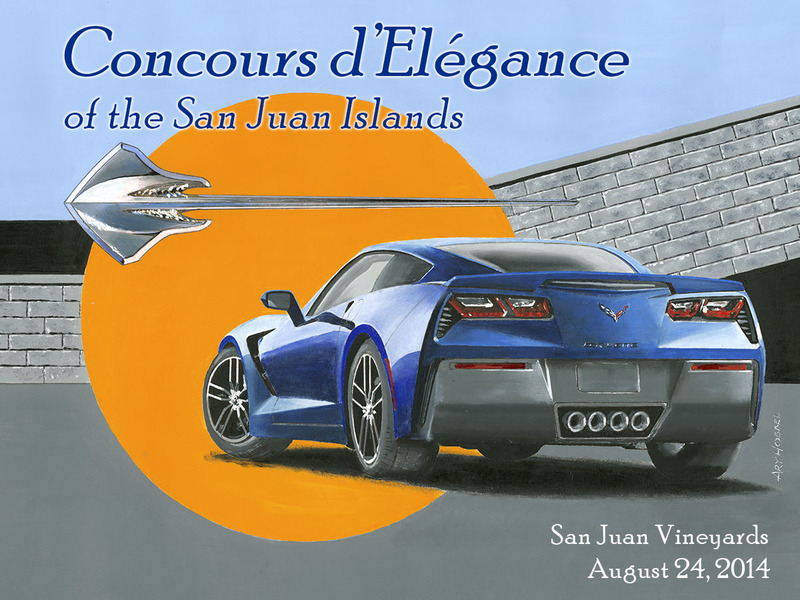 The Concours is a charitable event; the beneficiaries for 2013 are Fish for Teeth, the Family Umbrella Group of San Juan Island, and the Rotary International Polio Eradication Project. An important source of support is provided by our Sponsors: Barrier Porsche, Road Scholars, Lowe Construction, Printonyx and the San Juan Vineyards. THANK YOU to everyone who helped make this year's 6th annual Concours a huge success. With your help we had a record 93 cars entered, raised over $8,500 for our beneficiaries, and had a great time! 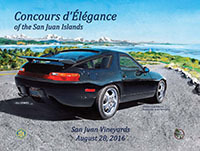 The Concours is an annual event organized by the Sports Car Club of the San Juan Islands in conjunction with the Rotary Club of San Juan Island, at the San Juan Vineyards. 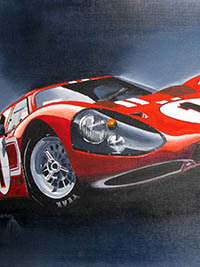 The Concours is a charitable event; the beneficiaries for 2012 are Fish for Teeth, the San Juan Island Family Resource Center, and the Rotary International Polio Eradication Project. An important source of support was provided by our Sponsors: Barrier Porsche, Palace Theatre, Printonyx and the San Juan Vineyards. Photos are posted, with more to follow-- click here or on "2012 Photos" at the left. (Prints are also available for some photos, check the top of the photo page). And again, a Huge Thank You to the Rotary Club of San Juan Island, to Barrier Porsche, to San Juan Vineyards, to our many volunteers, and to the entrants and spectators, without whom none of this would be possible. Thank you for a great event! 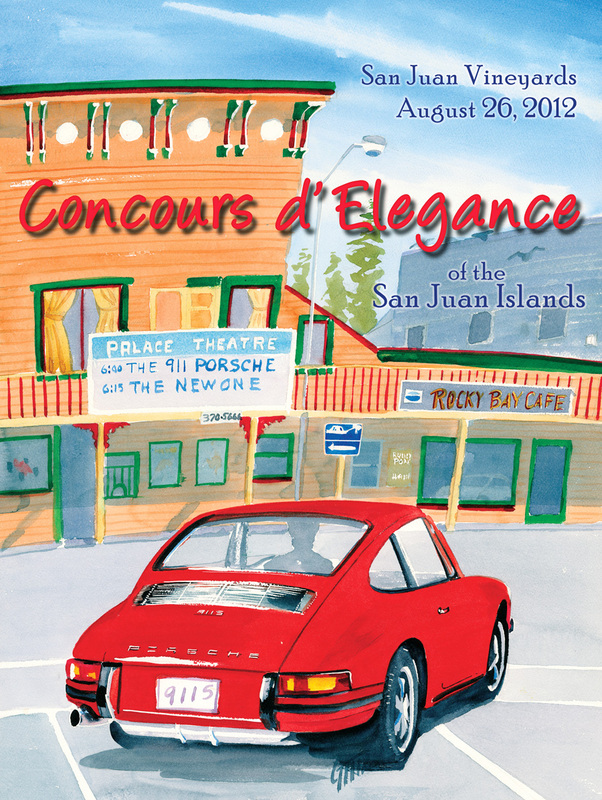 The Sports Car Club, in conjunction with the Rotary Club of San Juan Island, held its 5th annual Concours d'Elegance on August 28, 2011. 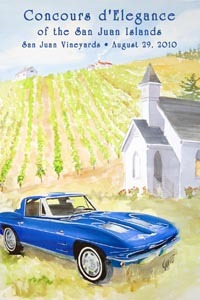 The weekend started with an island car tour and BBQ picnic at the Winery on Saturday, and the Concours on Sunday. The weather was perfect, attendance was terrific and about $6,000 was raised for the beneficiaries, the Family Umbrella Group, Hospice of San Juan, and Rotary International's Polio Eradication Project. 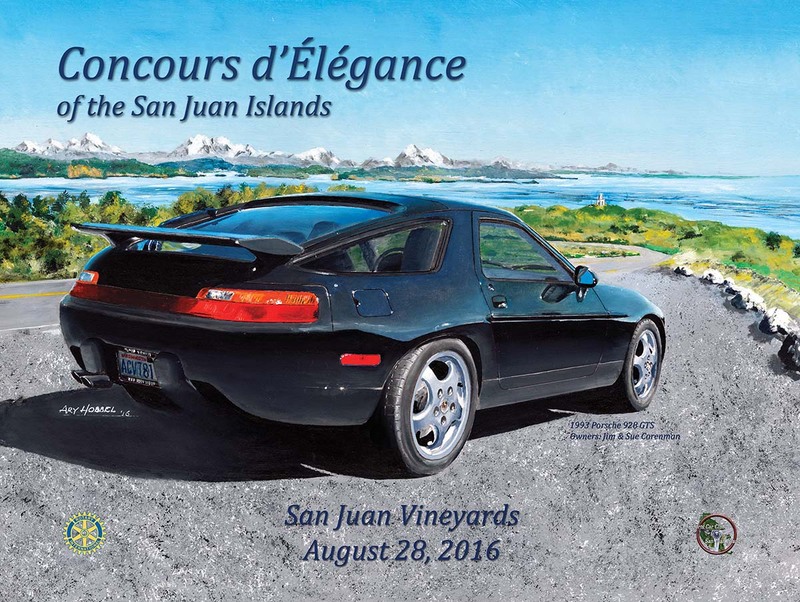 The Sports Car Club of the San Juan Islands extends a huge Thank You to the Rotary Club of San Juan Island, to Barrier Porsche, to San Juan Vineyards, to our many volunteers, and to the entrants and spectators, without whom none of this would be possible. Thank you for a great event! Pictures of the 2011 event are here. The Sports Car Club of the San Juan Islands, in conjunction with the Rotary Club of San Juan Island, held its annual Concours d’Elegance at the San Juan Vineyards on Sunday August 29, 2010. The weekend started with an island car tour and get-together Saturday afternoon and a chance to tour a local member's magnificent Porsche 356 collection. A huge "thank you" to Barrier Motors for their continued sponsorship; to Liberty Printing for again supporting us with printing; to the Rotary Club San Juan Island for their tireless work on behalf of the event and the beneficiaries; and to Yvonne Swanberg for providing the wonderful venue and lucious wine. Cynthia's "of Course" catering and the Medical Center Guild of San Juan provided breakfast and lunch. The beneficiaries of this year's event were the Hospice of San Juan and Rotary's "Polio Plus" project to eradicate polio world-wide. Entrees were judged in six categories, including Porsche, American Sports, and Special Interest. Pictures of the 2010 event will be posted shortly. 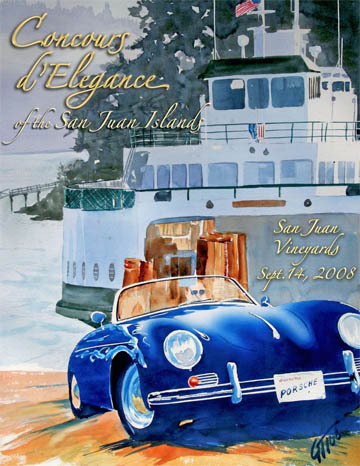 The August 30, 2009 Concours was a huge success with over 80 vehicles exhibited. 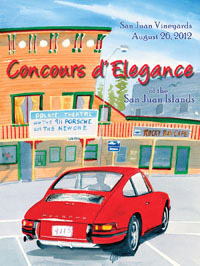 Once again we want to thank all the Entrants, Volunteers, and our Sponsors: Barrier Porsche and King Printing & Design. A total of $8400 was distributed to the SJI Family Resource Center, the SJI Public School foundation, and the Rotary Club's PolioPlus Project. These funds were donated by the Sponsors, Entrants, and Spectators. Many thanks to everyone who participated in the 2008 Concours, and to all of our great sponsors-- they did a terrific job, please give them lots of business. 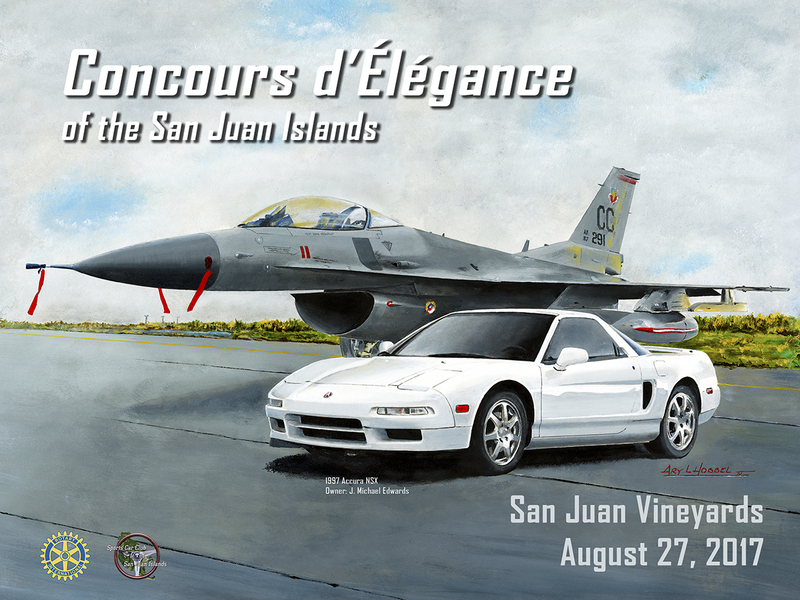 76 vehicles were exhibited, 60% had not been shown in the three years we have been at the San Juan Vineyards. 20 Porsches constituted the largest single marque, fittingly since Porsche was the featured marque. 24 cars participated in Saturday's Island Tour, a first time event. Over $9000 was raised for Hospice of San Juan through donations from Sponsors, Entrants, and Spectators . The Saturday evening dinner netted over $2000 for the Medical Center Guild. The Second Annual Concours d’Elegance of the San Juan Islands was held Saturday, August 25, 2007 at the San Juan Vineyards, 3136 Roche Harbor Road, Friday Harbor, Washington. This exciting show was organized by The Sports Car Club of the San Juan Islands. 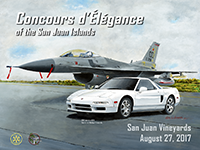 This year’s event set a record for vehicles on display in its second year at the San Juan Vineyards. 71 cars and unique vehicles were staged and, as an example, the Ford contingent included an original ’66 Shelby 427 Cobra, two modern Ford GTs, a ’65 Shelby 350 GT, ’55 and ’66 T-Birds, ’40 Ford Woodie, and a ’15 Model T. Spectator attendance, estimated to be in the hundreds by the level of very generous gate donations, was record setting as well. The net proceeds donated to the Inter Island Healthcare Foundation were more than $8,000. This amount, plus prior additional funds already in the queue from the private sector and foundations completed the purchase of the Inter Island Medical Center’s X-ray Digitizer. We are happy to announce that the event’s benefit goal has been achieved again this year. 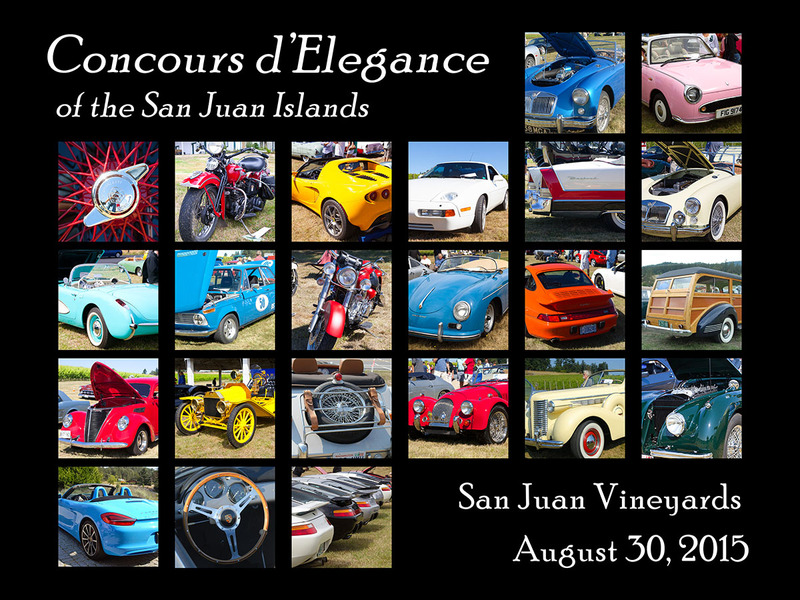 The Sports Car Club of the San Juan Islands, the Inter Island Healthcare Foundation and the Inter Island Medical Center are indebted to a host of individuals and businesses that have made this year’s event successful. To note a few among many others, our special thanks go to Yvonne Swanberg of the San Juan Vineyards, Marian Ford Webber of King Printing and Design, Gary Mathews the Roche Harbor artist, the Medical Center Guild, Barrier Porsche of Bellevue and Griot’s Garage. 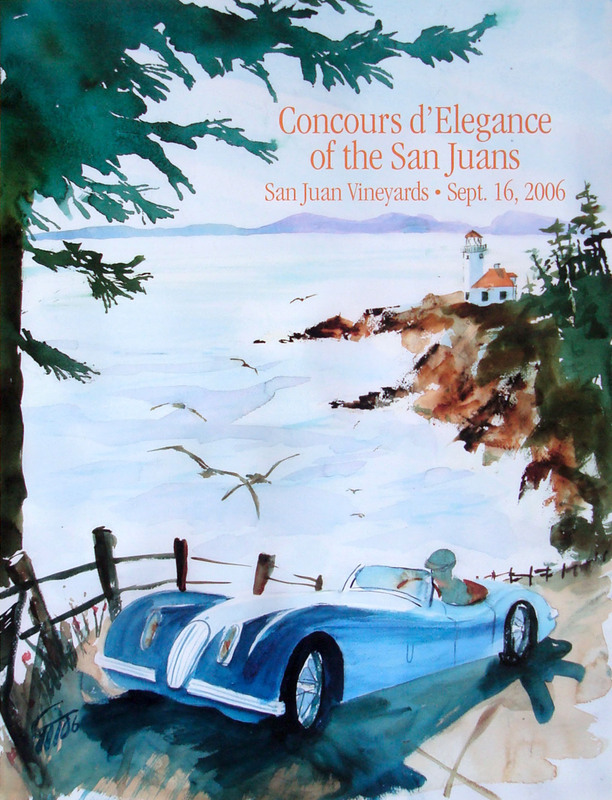 The First Concours d’Elegance of the San Juan Islands was held Saturday, September 16, 2006 at the San Juan Vineyards, 3136 Roche Harbor Road, Friday Harbor, Washington. More than 50 cars were exhibited including many notable entries: A rare 2004 Porsche Carrera GT; this car represents engineering’s finest in road cars for Porsche. Only 1500 were built worldwide, sold for about $440,000 each, and were the fastest legal road car in the US at the time. And, of course, no car show would be complete without the Ford Model T, the real beginning of mass production automobiles in the US. Two outstanding examples were shown, a stunning yellow 1914 Model T Speedster, and a perfect black 1915 Model T.
Three awards voted by the entrants and the public were presented as well as three choices by the Organizer. 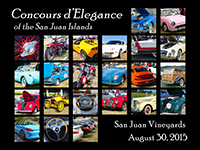 The Concours d’Elegance proceeds went to benefit the Inter Island Medical Center through the Inter Island Healthcare Foundation*, and the San Juan Island Family Resource Center*. The three events (Concours, Auction, and Dinner) raised more than $52,000 for these two charities. * IRS 501(c)3 organizations allowing tax exempt contributions. Griot’s Garage provided car care products for the six award winners.